Right now, I am in need of a nice cup of tea and a lie down, having just witnessed the manouvers of an RAAF FA-18 Super Hornet at Brisbane’s South Bank. Quite by accident, we find ourselves at Rydges Hotel Southbank for the annual Brisbane Festival launch – ‘River Fire’. 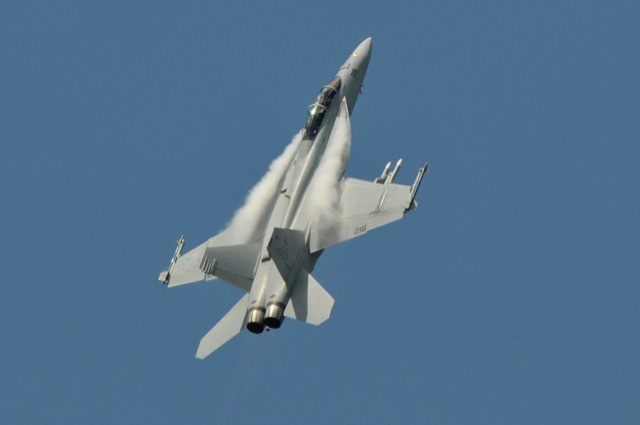 Tonight, we will have a front row seat from the balcony of a room overlooking the river to enjoy the fireworks, and that will be nice; but this afternoon we have just witnessed the F-18 flypasts and I am literally shaking. The pilot no doubt enjoyed his opportunity to show off, and good on him; but I have to say, I had no idea until today how exhilarating and terrifyng it can be to be within quite close range of a modern fighter jet as it blasts vertically into the sky almost directly above you. As I watched the Hornet streaking in for its final pass, I said to the others, “Look out! This is going to be loud!” But they couldn’t hear me. My God! The words ‘the wrath of God’s own thunder’ come to mind – all very harmless and exciting when it is for a festival display (Catherine says she now wants an F-18 fly-by for her next birthday! ), but imagine the terror of squadrons of the things coming to bomb you and your family into the Stone Age. Why can’t we just have a magnificent QANTAS A380 doing a couple of slow passes? I’m sure it would be equally spectacular (and loud) and would not make me feel I am taking part in a Tom Clancy novel. ~ by Garry on September 3, 2011. As you experienced this quite by accident, did you just go to Southbank for a R and R weekend and ended up in the excitement of Riverfire. We watched in awe on TV when the FA18 did its manoeuvres . Great experience for you all. Quite by accident. We booked for Father’s Day/birthday weekend, not knowing anything about River Fire. Worked out rather nicely – great view from the 5th floor balcony overlooking the river, about eyelevel with the aircraft. Fireworks were pretty good too. Might do it again next year.